Cardinal Dolan greets marchers in front of St. Patrick’s Cathedral. A pipe and drum corps from Long Island look and sound just right. Cardinal Edwin F. O’Brien, a native of New York City, returned to deliver the homily at the parade Mass in the cathedral. Two ginger-haired young girls enjoy the parade. Students from Manhattan College stride with smiles on their faces during the 258th New York City St. Patrick’s Day Parade in Manhattan March 16. St. Patrick came to Ireland as an immigrant, though an unwilling one, having been captured as a teenager from his home in what is now Britain and sold into slavery in Ireland. Alone for hours tending sheep on the hillsides, he began to pray. After six years in captivity he escaped and returned home, but he sensed a spiritual plea from the people of Ireland to return to them. He felt a call to bring God to them. He studied for the priesthood in France, and after being ordained he went back to Ireland and converted the entire island to Christianity. The celebration of his feast day, at Mass in St. Patrick’s Cathedral and then at the annual St. Patrick’s Day Parade in Manhattan, was filled with gratitude for the faith that Patrick brought to the Irish and the Irish brought here. It also promoted a spirit of welcome and compassion for immigrants today. Welcomed with warmth and applause was the 69th Regiment of New York, the famous “Fighting 69th,” whose members marched into the cathedral to attend the Mass and later led the parade up Fifth Avenue. The Mass and parade took place March 16, as always when St. Patrick’s Day falls on a Sunday. Worshippers, many wearing green, filled the pews in St. Patrick’s Cathedral. A spirit simultaneously exuberant and reverent seemed to fill the air. The cardinal, in an interview, spoke of the extreme poverty of Irish immigrants who fled the 19th-century famine that killed 1 million and caused about 2 million more to leave their homeland. The Irish, he said, “came over here with nothing, hardly the clothes on their back…but they had what Jesus called ‘the pearl of great price,’ their faith, and they knew that the faith was a seed that they had to plant. The homilist was Cardinal Edwin F. O’Brien, grand master of the Order of the Holy Sepulchre and Archbishop Emeritus of Baltimore. He was previously Archbishop for the Military Services USA. Born in the Bronx, he was ordained for the New York Archdiocese and served as rector of St. Joseph’s Seminary, Dunwoodie. He paid tribute in his homily to the Fighting 69th for valor and sacrifice throughout its history. He recalled celebrating Mass several years ago on the Civil War battlefield of Antietam—the site, he noted, of “the bloodiest battle in any single day of an American war”—and he spoke of a young member of the 69th, Pvt. Thomas Connors, who died there. The cardinal read from a letter addressed to Connors’ father on Mulberry Street in Manhattan, from Connors’ commanding officer, who described the young soldier as deeply devout. “All last winter his comrades in Company C were edified by his regular attendance at Mass, and also by his so often approaching the Most Holy Sacrament,” the officer wrote. He told the 69th that although they are “no longer largely Irish or Catholic,” they “carry on the noble, heroic traditions of the Irish Brigade.” He pointed out that the 69th was the first military unit to respond on 9/11, and that it lost two members that day. He praised Irish missionaries and the congregations of sisters, many of whom were Irish, that operated schools. Their service to the poorest “in large part accounts today…for this archdiocese’s Inner-City Scholarship Fund,” which for decades has given minority students hope for their future, he said. Faith in the dignity of each human life underlies “the vitality of our vast network of American Catholic health centers, and residences for the aging, the poor, the addicted and abandoned,” the cardinal said. That faith also “inspired John Cardinal O’Connor, with Mother Agnes Mary Donovan, to found the Sisters of Life in 1991…And how crucial their cause is now,” Cardinal O’Brien said. “We thank the Sisters of Life for their witness to the dignity of such helpless, vulnerable lives,” Cardinal O’Brien said. “And in a special way this morning we thank…Archbishop Timothy Michael Cardinal Dolan, for challenging a culture which, believe it or not, proudly permits such atrocities upon newborns—in the name of compassion! 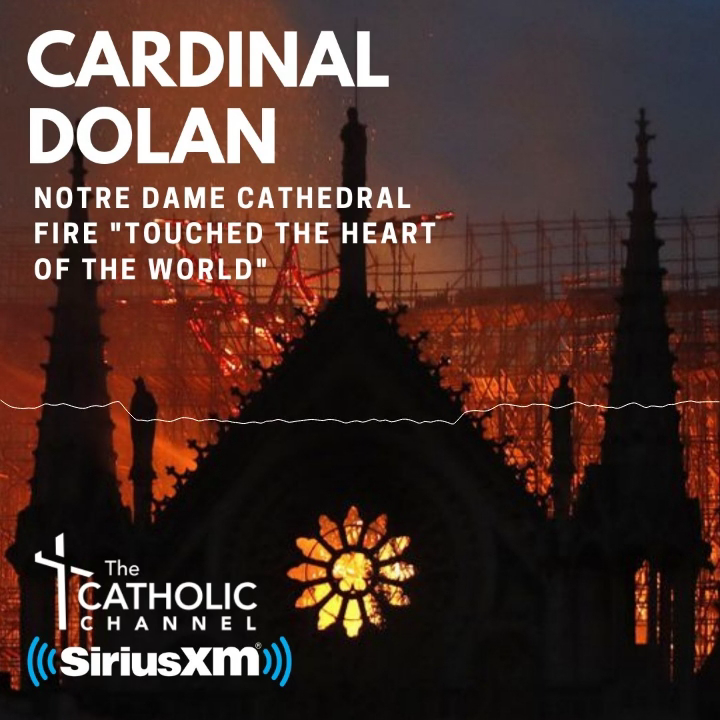 The cathedral congregation twice responded with enthusiasm when Cardinal O’Brien asked all to stand and applaud: first for the Fighting 69th, and later for Cardinal Dolan. The parade grand marshal was Brian J. O’Dwyer, senior partner at O’Dwyer and Bernstein LLP, the firm founded by his late father, Paul O’Dwyer, an Irish immigrant and an advocate for immigrants’ rights who served as president of the New York City Council. At the parade, pipe bands filled the air with music and drumbeats echoed like thunder off the walls of Fifth Avenue’s buildings. The Irish county societies carried their banners bearing the images of saints and heroes. “It’s fantastic—the bands, everything!” she said. She added that New York is “an amazing place.” She visited 18 years ago, but won’t wait that long next time. “I’ll definitely be back for the 17th next year!” she said.